Preparatory Courses are specially designed for students whose command of English is compatible to levels on B2 First (FCE) - level Upper-Intermediate and C1 English (CAE) - level Advanced, and want to confirm their command of English by earning a Cambridge Certificate. The classes are focused on practical preparation to the Certificate examinations. 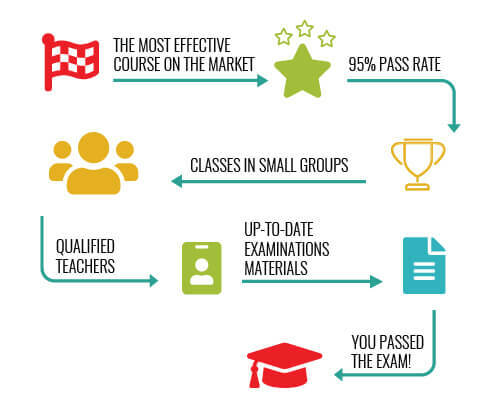 Because 95% of our students who take part in our courses get their B2 First (FCE) or C1 Advanced (CAE) certifications. they are recognized in many companies and universities all over the world. I always dreamt about the CAE certificate. Now I finally have it. The course is well structured and we quickly focused on what we had to do. The classes are focused on real exam practice. Highly recommend. Teachers are great and they know their stuff.